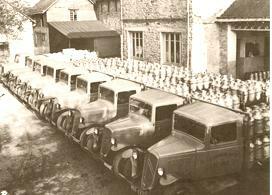 On 19 October 1933, André Besnier, left his job as butter churn maker to become a cheese maker in Laval, Mayenne. He collected 34 litres of milk on the very first day, and used it to produce 17 Le Petit Lavallois Camembert cheeses. 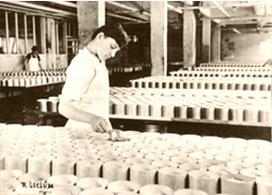 In 1947, he began to expand his business and moved into a more modern facility in Laval. It was where he began to produce Camembert, white cheeses, petit suisses (white and fresh cheese) and butter. It was not before long when he was widely recognised as a specialist in producing high quality butter. In 1950, his operations collects an average of 10,000 litres of milk per day, and has about thirty employees. In 1955, he passed away suddenly and the business was succeeded by his 27 year-old son, Michel Besnier. Michel was a great cheese-maker and a talented businessman who was capable of communicating uniquely about his business. He officially launched the Président brand in 1968. Since then, Président’s products have always enjoyed an excellent reputation. His most famous cheese is, however the Camembert, amongst other award-winning products. It has since become a representative product under the Président brand. Always innovative, Michel Besnier is the first to introduce the UHT packaging into France, and more significantly, it is the first to develop the technical production of Camembert with pasteurised milk. The Président brand was formally established in 1968. Let us tell you about the brand story of Président! The celebration continued and went to check if they could register “Président” as a trademark. Four days later, the Président label was legally established and launched.